September 1st, 1916 the city of Berlin, Ont. changed its name to Kitchener. The region was home to a large number of people of Germanic descent and saw a lot of sentiment against them. But a major impeller for the change was economics. Kitchener mayor Berry Vrbanovic has noted the centennial anniversary of the city's name change. 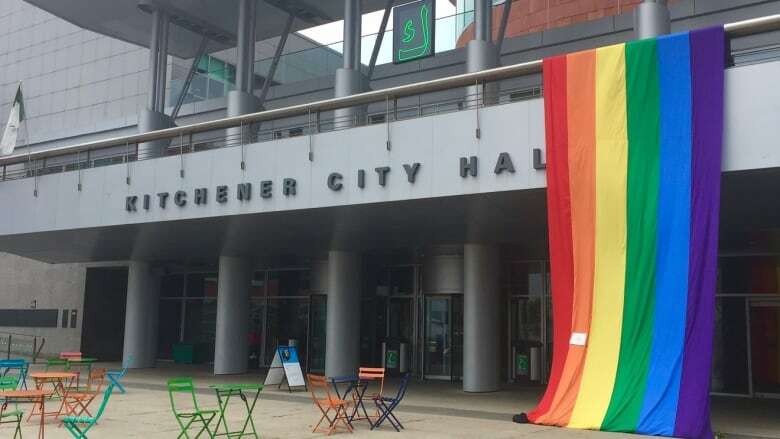 "While the circumstances that prompted the name change were grim, that drive to reinvent, re-imagine and move forward in the face of adversity carried our city through and ultimately defined Kitchener and how we would continue to shape our own future in the century to come," Vrbanovic wrote in a statement Thursday. September 1st, 1916 the city of Berlin, Ont. changed its name to Kitchener. "It was a very fractious time," Tom Reitz, manager-curator of the Waterloo Region Museum told Colin Butler on CBC Radio's The Morning Edition. It was the middle of WWI and the region was home to a large number of people of Germanic descent who saw a lot of negative sentiment against them. "A Lutheran minister was pulled out of his house ... he was dragged through the streets. German clubs were ransacked through the course of the war. It was just a really nasty time period." When that anti-German sentiment started to affect industry and the local economy, it was time for a change. Kitchener was a big manufacturing centre in those days. From leather goods like saddleware, horse tack and shoe leather to furniture, meat packing, and pianos – the city was a major industrial centre. "Those products proudly stamped 'Made in Berlin, Canada' weren't selling. And so the Board of Trade is really the instigator behind all of this and said 'you know what, for economic reasons we need to change the name of this place'." 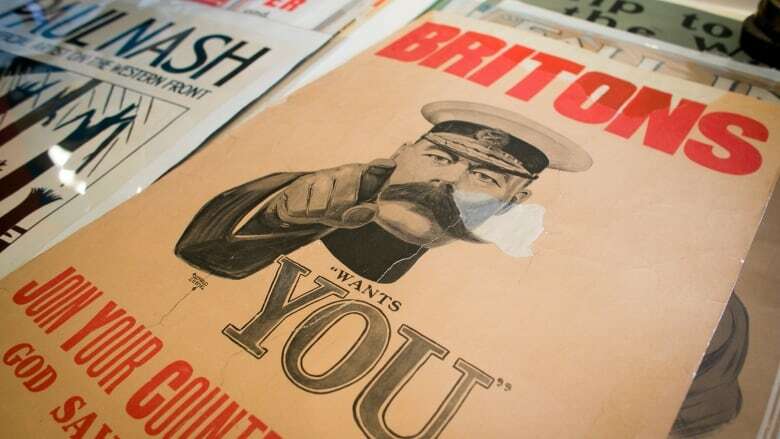 Lord Kitchener: is it possible he killed himself? 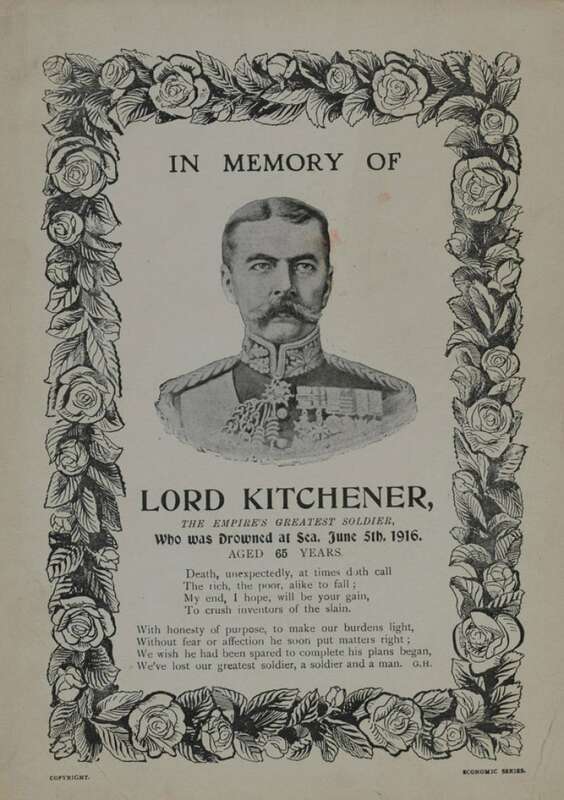 Committees were struck, contests were held (with some suggestions ridiculed in the national press) and eventually, after many meetings and a public ballot, the city named itself after the British Field Marshal Lord Kitchener, commander of the British Army and colonial administrator, who died in early June, 1916. Vrbanovic, noting the widespread public involvement in the name change, said the spirit of public consultation and willingness to adapt is still reflected in the city. 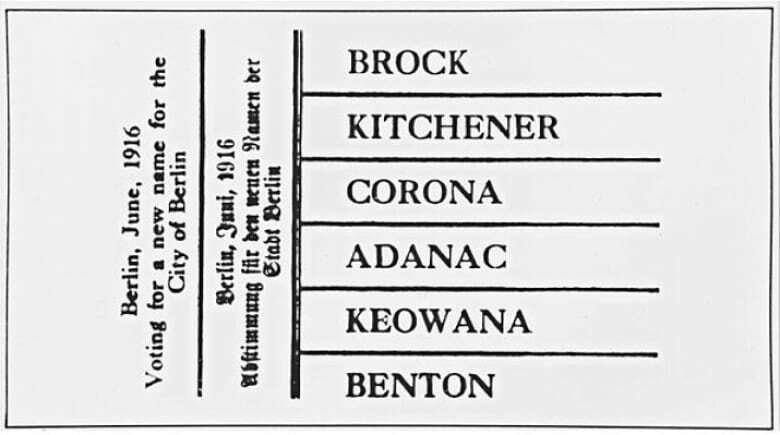 The shortlist of potential city names on the final ballot in the name change vote from Berlin, Ont., 1916. "Through what was likely one of our first community engagement campaigns, citizens chose to "Make it Kitchener" and we have been doing that every day since." "That resilient spirit has become the foundation of many courageous and innovative decisions that have given Kitchener an economy that is envied," he said. Listen to Tom Reitz, curator-manager at the Waterloo Region Museum describe the tumultuous time in 1916 when Berlin, Ont. contemplated its name change on CBC Radio's The Morning Edition.